Every year when I get ready for my week at Quilting by the Lake, there always seem like a million things to do. This year, my teacher Judi Blayden asked us to prepare pre-class homework. Not only where we to pick the paintings we wanted to abstract but also to do a little research into the painters. Nabis. His work, which has a dream like quality, often featured domestic scenes featuring his wife and family. He used vibrant bold colors to not only express the actual scene itself but also the complex imagery he wanted to express. He is regarded as the greatest colorists of modern art. 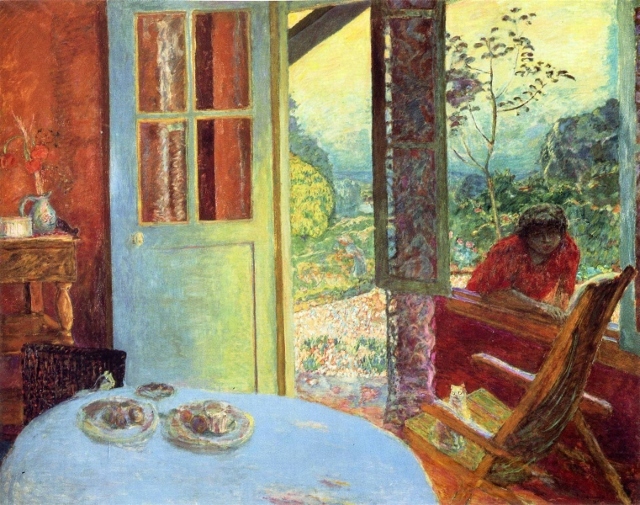 Since one of my true loves is to play with color, I think that's why I was instantly drawn to Bonnard's work. In The Dining Room in the Country, he slides masterly from the cool colors of the exterior to the warm colors of the interior, evoking a sentimental - at home kind of feeling. The goal of my abstraction is to play with moving cool colors to warm. strangeness of familiar surroundings. His realistic scenes of everyday life mostly conveyed a mood of loneliness, isolation and anonymity. He continued with his figurative work although the trend during the mid 20th century was abstract. 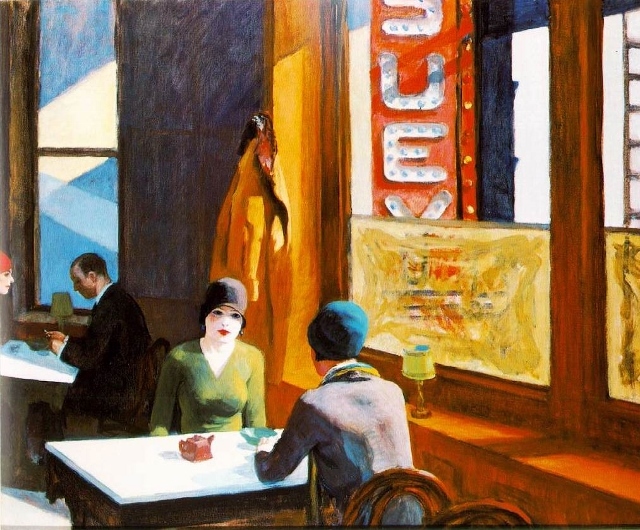 I have always been drawn to Hopper's work. There is always a sense of mystery in his painting which makes me want to ask why are these people so lonely? I love how he uses architectural lines to solidify his scenes. The goal of my abstraction will be to play with architectural features and to create a sense of mystery. 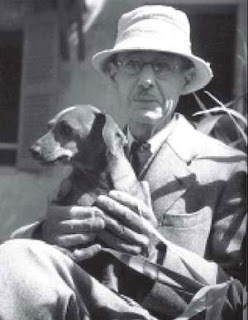 Now you have me wanting to learn more about Bonnard. I love his colors. Nice choices (though I must admit that Hopper is my favorite). I am looking forward to seeing how the inspiration will used. Probably no need to mention but I hope you will enjoy the workshop. I must learn more about Hopper. Thanks. I will be very interested in how you abstract these pieces. I do love the Hopper also. Lucky you to be going to Quilting by the Lake! Abstract is such a challenge for me so I'll be vicariously following along. Wonderful colours for you to work with. Just the wikipedia page about Les Nabis was enough to get me wishing I could paint rather than stitch. Have a wonderful week by the lake! I am struck by the photos of the paintings you have posted. Both have wide windows and doors. Lots of light. Strong, vertical lines. Whatever they speak to you, they seem to speak in concert. I look forward to what you learn at QBTL. I'm thrilled to have found your blog. I bunny-trailed here from someone who linked up to my own. Thank you for linkys! So much of my current thought process is moving away from trying to follow what other quilters believe is 'good'. I'm trying to redefine it for myself. I have a stack of books beside my chair and bedside, and they cross from classic artwork to mixed media, but mainly focus on creative process. You have so much to offer on your blog, and I'm adding you to my 'pile' of goodies. 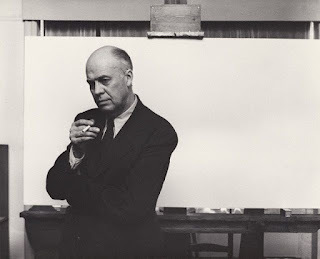 I'm also a huge admirer of Edward Hopper! Great choices for your homework.